Editorial: Is Nintendo Purposefully Causing Scalping? What you see here is the NES Classic Edition, also known as the Nintendo Classic or "NES Mini" depending on who you are talking to. It's arguably the hottest toy/game of the Christmas shopping season, though I've also heard and read that Spin Master's Hatchimals could give it a run for the literal money in terms of how hard it is to find for your kids. Some might see this editorial as an opportunity to bemoan the capitalistic consumer driven culture we live in, and on the right day at the right time that might be true, but given consuming is almost inherently in our nature I'm not actually going there this time. I don't hate being a consumer after all - I like video games, music, and collectibles as much as the next man, woman or millennial. You probably do too since you're reading a site called "Rap Reviews" after all - you like to consume rap music in physical or digital form. Being a consumer isn't a shameful thing. After all how would we live if we didn't consume food, and how would we breath if we didn't consume air? If you view consumption as inherently evil you're saying mere existence is evil too. Now conspicuous consumption or gluttonous consumption, you may have an argument about the evils of those things, but again that's not what I'm here to discuss today. I've been down this road before with Nintendo's line of toys-to-life Amiibo figures and as a consumer of their products I learned from that experience to ALWAYS pre-order wherever possible. 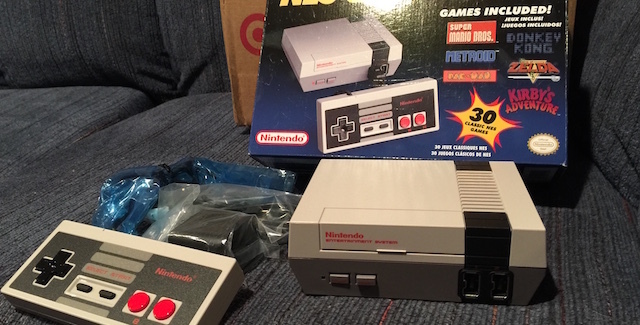 Only one retailer made that possible this time - Target.com - and they only had pre-orders available for a limited time. You either got in during that window of opportunity or you didn't. Everybody else had to wait in lines outside stores on release day (November 11, 2016 in the United States) and hope the store they visited had enough to meet demand. Again you had to be really early in that window of opportunity - if you didn't camp out far enough ahead of time you weren't going to get one. Some stores ordered a hundred and only got 12. Some ordered 30 and only got ONE. Some didn't get a shipment at all. Whether you consider it a toy, a video game, a console or a slice of nostalgia, consider yourself a little lucky right now if you're reading this and you have one. As with the aforementioned Amiibos this has become a debacle that seems incomprehensible unless you read intentional machinations behind the severe shortages. Once again we are talking about a product with a lot of plastic and a small amount of electronics inside it. While the initial outlay into research and development, programming and product testing may have run up a tab, the actual cost of assembly and production is undoubtedly low compared to the $59.99 MSRP. The only thing which keeps this from being pure profit on Nintendo's part is the fact they manufactured it with licensed third party games. They don't own Mega Man - Capcom does. They don't own Gradius - Konami does. I could give more examples but the point is that to pay the licensing fees for these games, they need to sell as many copies of the Nintendo Classic as possible. Why then would something they can easily rapidly make as many of as they want to be short printed, especially since the more they sell the more their profit margin grows and the more they cover the initial costs outlined above. What's going on is that this is an ENGINEERED shortage. It's not because of a lack of plastic and silicone available to make the case or the chips. There's no shortage of either in the world at this time, nor is there ever likely to be, or we wouldn't all have the computers and smart phones we are now reading this on. No there's no lack of available materials to make the product, there's a lack of product because NINTENDO DIDN'T MAKE ENOUGH ON PURPOSE. They will of course deny this, but they've already learned from short printing Amiibos that they create "buzz" about how hot the item is and how hard it is to get, and then capitalize on that buzz as they slowly and inevitably increase the supply, ensuring that the demand remains up due to how long desire has been pent up. There's nothing that will frustrate a consumer more than having the money to consume but the good you want not being available. When you go to the concession stand at a sports event and they're out of french fries, does that make you suddenly stop wanting french fries? Even if you eat something else you just wind up wanting fries MORE. That's not an engineered shortage, that's just a lot of people eating fries that day, more than the vendors anticipated even though they stocked up in advance before the game. Nintendo KNEW the demand existed, anticipated it, and PURPOSEFULLY didn't meet it in to drive up frustration and garner free publicity that would keep the item selling far beyond Christmas. Is this evil in and of itself? Surprisingly the answer is no. Understanding human nature and taking advantage of it may seem base or crass, but it's also good business, and Nintendo is after all a business and not your friend. The evil of intentionally short printing an item to create high demand is that it creates a vacuum in the marketplace, and scalpers step in to fill that void. That's why you can currently find no shortage of NES Classics on websites like Craigslist and eBay going for anywhere from double to five times the list price (or MORE). I take a far dimmer view of scalpers, because they artificially manipulate the marketplace or "corner the market" if you will by buying up the already limited supply and then charging far beyond the intended retail price because they can. You could never buy up all the french fries in your market - potatoes are cheap and plentiful and many different companies make fries out of them. You could never corner that market. A few hundred scalpers can corner the market on a toy or game console though if each market gets an already limited amount of that good, again because Nintendo purposefully makes less than the market demands, and not because they don't have enough potatoes to make more fries. Therefore whether Nintendo wants to admit it or not, they are intentionally causing the scalping of items like the NES Classic, because if there were enough fries/Minis for everyone you wouldn't be paying $300 to get what you crave. The only solution unfortunately is patience. Don't pay the scalpers, no matter how much you crave a Classic, and wait it out until Nintendo has milked the free publicity the shortfalls have caused for all it's worth. Even if you don't get one for yourself or you kids for Christmas, you will be able to get one... eventually. You just have to wait it out until Nintendo stops being d--ks and giving scalpers all the ammunition they need to hog up the limited supply and create additional artificial demand to line their pockets. There's one other solution - pre-order. If you see one, use it. Nintendo won't help you - you've got to help yourself. Best of luck to you as a shopper this holiday season.